Volunteering - Plus Forth Valley Ltd.
PLUS is pleased to consider applications from volunteer drivers, playworkers and youth workers or administrative support. There are many roles available at PLUS – volunteering, becoming a trustee, or taking on an advisory role with the board. If you would like to know more about how your skills could benefit PLUS, please get in touch for further information, or have a look at our vacancies page. Do you want to put your professional talents to greater use outside of your regular nine to five work? One Day Can Change a Life! Volunteering is not only personally rewarding, but also enhances local community strength. Giving back to the community is just one of the ways to make a difference in the world. 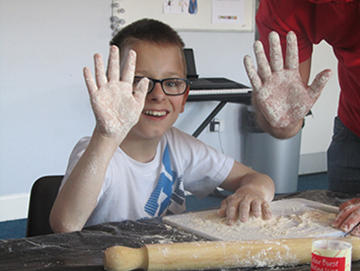 At PLUS there are a number of ways to get involved and support our mission to improve the quality of life for child and young people with a disability and additional support needs within the Forth Valley area. PLUS is looking for enthusiastic volunteers to support PLUS in a range of ways including: fundraising; graphic design; administrative and project support opportunities! I have been volunteering with PLUS for over 2 years now. I started off working in the office which I enjoyed - but I really wanted to dedicate my spare time to actually being involved with the young people who PLUS supports. Being a volunteer youth worker through Count Me In is unlike anything I have experienced before. It can be emotionally challenging from time to time but it is an extremely rewarding commitment overall. To know you are making a real difference to a young person and their families life is a really satisfying way to dedicate your time. I would recommend joining PLUS to anyone who wants to develop themselves whilst supporting young people to also develop and to have fun. It has really helped me to grow as a person over my time at university. As a volunteer, I have been welcomed into the PLUS community and I have experienced, for myself, the distinctive, caring and respectful ethos that PLUS naturally maintains at all times. I have enjoyed volunteering with the after school club which is well- structured and adaptable to the interests of the children and young people who attend on a weekly basis. The staff and volunteers are so friendly and kind, working to promote friendship and positive experiences in a relaxed environment. I have seen the excitement and pleasure which children gain from their time at PLUS and the supportive network that PLUS can provide for parents/carers. To anyone who is thinking about volunteering for PLUS, I would definitely recommend PLUS. I feel supported in my role and the work is flexible while I am studying at university. It is great to be involved with such a wonderful organisation. My experience with PLUS so far has only ever been positive and a real blessing to my university life. I’ve had many Tuesday’s where the thought of heading to After School Club that afternoon has allowed me to stay sane! I’m not too sure who actually has the most fun between myself and the young people, but I guess as long as there’s fun being had that’s all that matters! Volunteering with PLUS really is one of the best ways I could have spent some of my university life and I’ll be very sad to leave when that part of my life ends. Both the young people and staff, week in week out, have been an absolute pleasure to be around. My advice to anyone considering volunteering with PLUS would be to DO IT! Your help is so appreciated externally but as well as that you personally get so much out of it. I had very little experience working with young people when I started to volunteer with PLUS- but I was offered relevant training opportunities and chances to develop my skills. 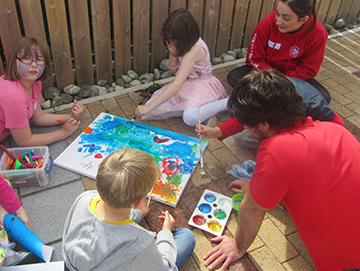 Staff members are all very friendly and dedicated to helping the children and young people we support to enjoy themselves and meet their outcomes through play activities. Throughout my time at PLUS, I have developed new skills, increased confidence levels and expanded my experience working both independently and within a close team. To anybody thinking about volunteering with PLUS…DO IT!! 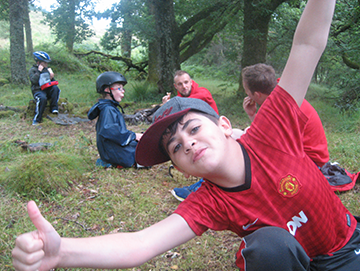 The children and young people who we support are energetic, fun and grateful for all of our help! Not only will you develop existing and new skills which are vital for future employment- you will be part of a great team who are passionate about providing high quality services to the children we support, and their families! I guarantee you will feel a high level of job satisfaction knowing that you have made a positive impact on your service user’s life! I became a volunteer for PLUS in May 2014, as I was looking to gain some experience in social care and support work. As a volunteer, I participated in the Count Me In Project the most and supported a young person to attend a Cubs Scouts session every week. Count Me In was just ridiculously fun, with new and exciting activities at Cubs every week! Watching a young person have fun and grow with your help is one of the most rewarding experiences that I have ever had. I feel that my time as a volunteer was crucial to preparing me to work, as I am now a sessional member of the staff team. Large parts of working as a support worker are confidence and simply practice in the role. Both of these qualities do not appear over night; they build up over longer periods of time. I believe that my time as a volunteer helped me to build on these skills and helped to make me the support worker I am today. As L has grown up, the gap in language (particularly difficult) and general development grows - which is inevitable due to her disability but this leads to exclusion in many aspects of school. L is a sociable and pleasant person, but the gap in this development and her lack of insight into safety, crossing a road etc means that she cannot go to a friends house unless 1. She is invited 2. She is taken. Even though this is an open and welcoming home, L is not asked to a friends house after school and a child only comes round when specifically asked. L is 10 years old and in the past year I have recognised a diminishing social circle. L is an only child. I supported L in Rainbows for 2 years, Brownies after that (explaining instructions, differentiating activities etc) until L got support from PLUS volunteers. As a parent I obviously want to support our daughter as much as possible but L does not want her Mother with her at every event! PLUS is not just about socialisation and play. It is a chance for L and other children to be away from their "ever present" parent, build independence, interact with peers of similar abilities (So the child may have a chance not to be last, slow, unable) to finish an activity. This is my 13 year old daughter Tia at the PLUS Christmas Fayre. 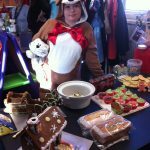 Tia had her own stall, selling her own handmade Christmas decorations, her own handmade cakes and cookies and selling tickets to raffle off her own handmade gingerbread house. This was something Tia would not have been able to do 6 months ago. Tia was diagnosed with Aspergers Syndrome 18 months ago. Along with this Tia also suffers from anxiety, communication problems and self esteem issues. 6 months ago Tia was not attending school, had anxiety related medical problems and had a hard time believing in herself. Then there came PLUS. Tia attends the Aspergers group every second Monday. It's a chance for her to meet up with people her own age dealing with similar struggles that she can be herself around. The staff members are understanding and caring and listen to Tia about her special interests and her likes and many dislikes. It's an informal environment that has set expectations of the children and a structure for them to feel safe. 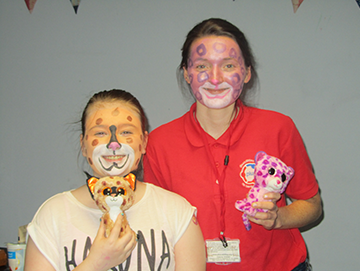 Tia is praised for her creativity and encouraged by all the staff to do what she loves as well as have a go at new and exciting (but sometimes scary )things. Because Tia feels comfortable in this surrounding and has learned to believe in her art work and was able to be herself, be proud of her work and ask people to buy her gifts and cakes. I'm proud of her, she's proud of herself and I know PLUS was proud of her too! It's not just a group for our family, it's a community.